Flurry says it has the means to measure activity across approximately 90 percent of smart devices worldwide, measuring about 2.4 billion application sessions across 275,000 applications around the world. With all this data in hand Flurry estimated that in the beginning of this year the U.S. and China were neck to neck, at 222 million versus 221 million respectively, in terms of active smart device installed. But this will change by the end of this month, according to Flurry, which says, China will have 246 million active smart devices compared to 230 million in the U.S. Furthermore, Flurry reports that U.S will not regain the lead, mainly due to China’s immense population, standing at 1.3 billion vs U.S’s 310 million. In fact, the only country with potential to eventually beat China, the report states, is India, which also has a population close to China’s. At present, however, India has only 19 million active smart devices. 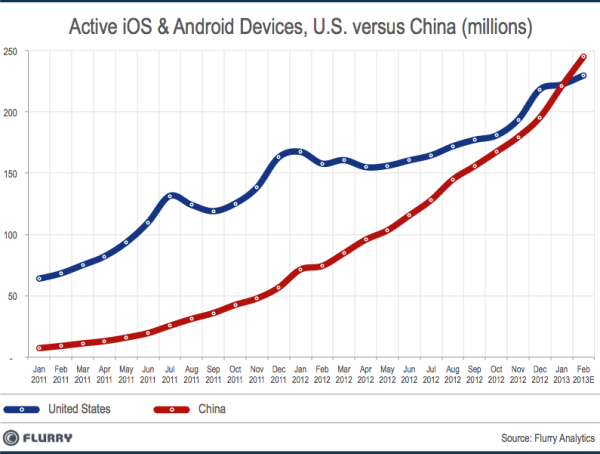 Going by Flurry’s charts representing data from January 2013 about the “Greatest number of active iOS and Android devices”, following the U.S and China is the United Kingdom at a distinct 43 million, followed by South Korea at 30 million and Japan at 39 million. Meanwhile, another chart that shows the data about the “Fastest growing iOS and Android markets by active devices” reveals Colombia to be at the top position, at 278 percent, followed by Vietnam at 266 percent and Turkey at 247 percent. China comes in at 6th position at 209 percent.